VMS for Hire or Variable Message Signs available for hire are the latest trend in the growing tools available for directing traffic. Our signs are all 5 colour signs and all new making it more of an attractive proposition. The variable colours attract more attention than the old amber signs. Making your message, the one people will be drawn to more. This sensational marketing and advertising tool at your preferred location, delivering your message can be made available simply by completing the form below or calling direct on 1300 792 845. Our rates are competitive and we bring the sign to you. The Variable Message boards or signs are made to the highest quality standards in our manufacturing plant which has ISO9001 accreditation to ensure quality and reliability. You can design and create any variation of colourful messages, graphic symbols, text or a combination. Simple animation can be developed using the multiple pages available. 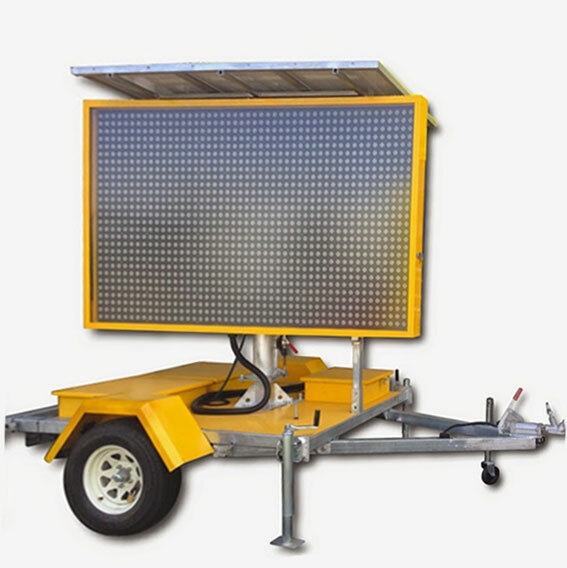 With innovation at top of mind, these signs are regularly used by many different industries to display traffic hazards, advertising and public notices of upcoming events such as sporting events. The VMS for hire machines are all built with cloud based technology. This simply means you can control the message from any device that has internet access. The web based application has been developed to be simple to used and easily accessible. To inquire about buying or renting these great marketing tools, simply click on the button to Contact Us.